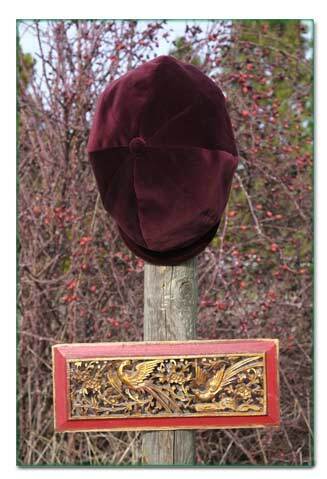 This Newsboy Cap is made with 100% cotton velvet. Carol is particularly picky about the velvet we use, here at Hat People, and this wine red velvet is truly luxurious. Although we preshrink all of our cottons, we still recommend cold water wash and line dry. This axiom also applies to cotton velveteen. Traditionally worn with the top of the hat pulled forward over the bill, pushing the top back has become very popular ~ especially among women. Yes, there seem to be just as many NewsGirls out there these days as NewsBoys! Whatever your preference may be, the hat will stay put in either position. There is NO snap on the bill. Our sizes are measured in inches of circumference and instructions describing how to measure your head can be found on our Ordering Information page. Hat People makes four different cuts in the Newsboy style. To view the difference between the Medium, Deep, Full & Extra Full Cuts please visit our Touring Cap Cuts page. Special orders can be arranged by email or by calling Hat People at (888) 930-4287. We have many more fabrics in our studio than can be shown on the web, so if you have something in mind that you don't see here, please feel free to contact us directly. There is no additional charge if your special order hat can be pulled from existing stock. Postage within the USA via priority post is included in the price of the hat!